Thanks for stopping by! Let me tell you that this is going to be a lengthy travleogue, so, in case you are in a hurry, you can simply watch a short film on our YouTube channel HERE. We started our journey from Panchkula and the first thing we did was to get fuel for our bikes. started dancing to warm up a bit. We put on more layers before leaving from here to be able to confront the extreme weather to come. Our group stopped at Narkanda for some repairing work and snacks..
lazed under the clear sky for almost an hour. We reached Rampur at around 13:30 P.M. and stayed the night there at “The Grand Shangri-La hotel” which we had pre-booked. We started from Rampur to Pooh at 09:00 after having breakfast near the hotel. As soon as you leave Rampur behind you, you can notice that you are going against the direction of the flow of River Satluj. You will always find the river beside you while you are riding at the lap of the beautiful valley. It can be easily perceived how glacial, freshening and pure the river water is by the sea green color and the chilling wind blowing on the periphery. There were many more mesmerizing views on the way. On entering the Kinnaur District we started seeing deserted mountains as we were moving forward. fuel that you need, here. We started from panchkula with two 5 ltr. cans each for a bike. Only after a few kilometers, came across this signboard on the way. the number of people going in the vehicle. weather before planning the trip. Fortunately, we had no trouble moving ahead. for a while and have some tea and snacks. and got us booked the PWD guest house of Pooh. We had a very comfortable night stay there. this part of the year as most of the hotels are shut down at this time. “contact us” form on the home page of The Guides. View from the PWD guest house at Pooh at 08:00 (Picture above). Our next halt was Tabo village. we started from Pooh at around 09:00 for Tabo. The Roads, the view, the challenge, the chill and everything else starts to get a notch up from here. The Sea green color can be seen of the Satluj river in the picture above. bluetooth speakers and danced to warm ourselves up, to cheer up. in the village only and is hard to be found anywhere else. here and are staying here from a long time and were built by buddhists. a snowfall. It was enthralling but, also, a little disappointing. We had planned to visit the popular Nako lake which is only around 2 kilometers from the helipad. otherwise, we would have been stuck on the way. So, we started off for Tabo village right away which is around 70 kilometers from Nako Village. Completely frozen waterfall. Stunning!! You can imagine the temperature. bad weather. It had already started snowing by that time. And we all were freezing. single glimpse of the sun. It was densely clouded than the previous night. We had a distance of around another 35 kilometers between us and our homestay in Tabo. The Satluj river beside us is now known as the Spiti river. and the wind was biting cold. nothing. But the weather didn’t allow us to go any further. visit the beautiful monastery. The Tabo Monastery is said to be Asia’s oldest monasteries! aura that we were surrounded by. All the tiredness and the chill seemed to go away. The place is indeed, spell-bounding. We didn’t feel like we were in any place of Himachal Pradesh. It felt like we were in some heavenly Buddhist place. So peaceful yet so powerful and exciting. warmth gleaming from them. We were welcomed warmly and greeted anywhere we went in the valley. Anyone who would cross you, will greet you saying ‘jhule’ (Lahualian Language), which means 'namaste' in Hindi. After exploring and taking blessings from the Tabo Monastery, we went to one of our riders’ friend’s place. We were warmly greeted there and were offered milk tea and biscuits. after the temperature on the outside is way below zero. invited by the Cherring homestay for supper, so, we had to leave. brings peace and positivity in the mind and the environment. It is said to be used for purging the soul. only in the clockwise direction. Now, there is one important thing you need to keep in mind if you are going for the white Spiti expedition, which is, water is very scarce in the valley during this part of the year. The pipelines are shut down because the water freezes inside them and when the water melts, there are chances of the pipes exploding. So, water is to be very wisely used here ( and otherwise also 😛😛). You will have to carry toilet paper rolls. Also, most of the homestays will not even have proper toilets; and even if they do, you cannot use them during winters. You will have to use dry pits instead. It was a whole new and amazing world for us ( for me, at least 😄). and very wisely used. The rooms of the Cherring Homestay were very comfortable and cozy. We all were provided a heater and 4 blankets each for one room. The rooms were very clean and well maintained. There was a separate dining room. The bathrooms attached with the rooms were not functional yet. So, we used one common bathroom. The place seemed very hygienic and very well- maintained. We used to play cards games during the night, poker with black eyed peas and used to enjoy a lot. beautiful Spiti valley as much as we could. So, we started off for the village ‘Kaza’ which is around 50 kilometres from Tabo village. Because there was always some or the other problem with the bikes, our mechanic was the one to save our lives. If you are planning on a road trip on bikes, please make sure you have all the spares and you have had your bike’s servicing done. You won’t find any mechanic for many kilometres at a stretch. Also, during this chilling winter time, you would see no one on the streets or the highway. Eerie views and pin drop silence is what you will confront. We started late in the morning. Visited Tabo Monastery before leaving and it had already started snowing. This was the most rough patch of the road we had travelled on till now, as it was almost completely covered with snow and dry ice. It took us almost 4 hours to reach kaza, a mere distance of around 50 kms. The mud guards of the tyres kept on getting stuffed with ice obstructing its movement and skidding ultimately. We used sticks to clear the guards. We saw some sun only after two days when we were about to reach Kaza. The view was breathtaking. It is a paradise; one of the best views I have ever seen in my life. when we woke up. Fortunately we could see the sun on fifth day. The sky was very clear. 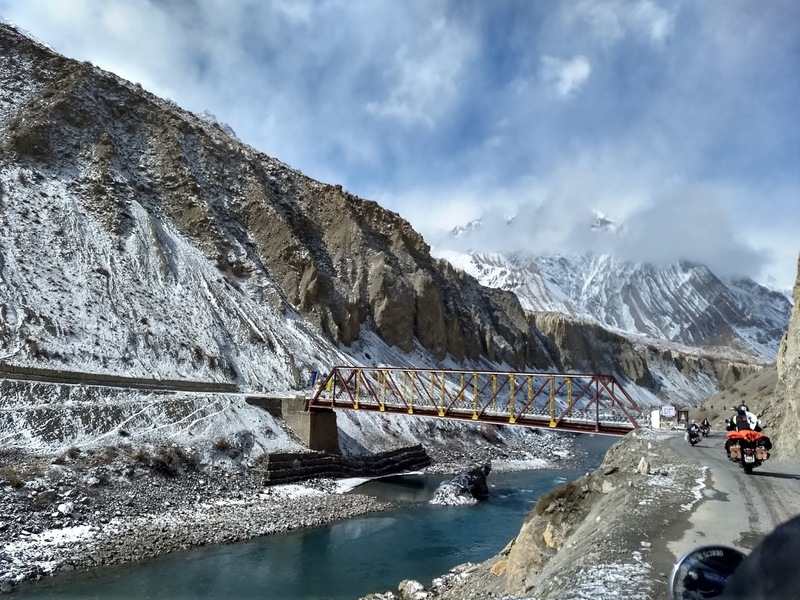 From Kaza, we couldn’t take our bikes further as the there was a lot of snow on the roads, so we booked a tempo traveller to visit other villages of Spiti valley. about a kilometre till Kibber village. The view was beautiful. There was snow all around and it looked very beautiful. We came across groups of photographers on the way trying to capture the shy animal, THE SNOW LEOPARD. They told us that they have been waiting here for a week to have a glimpse of the animal. However, we proved to be fortunate for them as they spotted one, inside a gorge right after we had reached that place. We felt very fortunate to be able to have a glimpse of the leopard. We also spotted Ibex and Red Fox! On the way back to kaza, we went to Kee monastery. with us to take the blessings. We were greeted by a monk. The only monk present there at that time. He showed us around and was very patient with us. we travelled, the more lack of oxygen we felt. Fortunately the sky was clear. On our way back we went to Gue Village to see and purge the curiosity of the Gue Mummy. The Gue village is the last Indian village, nearest village to China border. hair on head still intact. We returned to our homestays in Tabo by the night. They were mud houses, very beautiful and warm. This was our dinner for the night. enjoying. We later on get to know, that they were celebrating the new year in Buddhism. We considered ourselves very blessed to have experienced one more rare occasion. and share with everyone. They greeted us very warmly, asked us to join them and offered all of us all that they had prepared. It was very overwhelming for us. We left from there and reached Pooh village by the evening. I think, there is no dearth of articles and stories available on the internet or in granny's books, on love. Since our childhood we have grown up hearing and reading stories of prince and princesses falling in love and living happily ever after and of the pressure of 'staying' in a marriage by stigmatizing divorce, separation and live-ins. 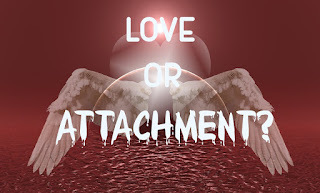 But, how many of these stories teach us to differentiate between love and attachment? Why is that couples break up within days or even after years of a relationship? What makes them do it? Why is that even after living separately, few relations can stand the test of time, while those living with each other don't even talk to each other? Whether it is a good or a bad time for us, whether you are young or old, whether it is for us or our loved one, we must have, at least once in our life been curious to know the future. We all have done it. Isn't it? But what if I tell you that knowing your future is actually bad for you? Off tracking a bit, I, personally, have been very keen, since childhood, on knowing my future. I used to be very excited to know what future holds for me. 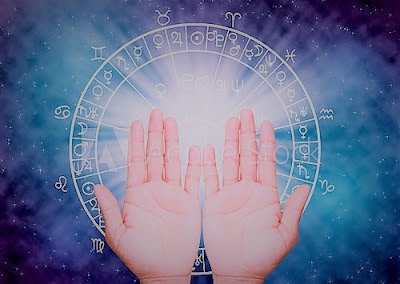 I used to ask my mom to ask an astrologer regarding my career, I have had my phase of crazy obsession for tarot reading too. I have tried oracle as well! Anyway, my point of telling you this is that I am no saint who has no interest in their future whatsoever. What I am trying to say is that there came a point in my life where I realized that knowing my future is actually not good for my future, if that makes sense!